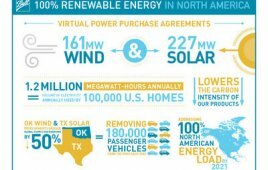 Developers in the U.S. purchased sufficient equipment to qualify 6.6 GW of new wind power capacity in 2018 for 60% production tax credits (PTC) under the Internal Revenue Service’s (IRS) safe harbor provision law, found recent analysis carried out by Wood Mackenzie Power & Renewables. The Wood Mackenzie report also shows that wind asset owners in the U.S. have repowered more than 3 GW of capacity under the 80-20 provision over the last two years. According to ‘Developers in the US Safe Harbor 6.6 GW of Wind Turbine Equipment in 2018’, more than 55 GW of equipment developers qualified through safe harbor investments in 2016 and 2017. The number for 2018 is an encouraging signal that offers upside to the outlook in 2022 when projects must be online. The research also revealed that wind asset owners in the U.S. have repowered more than 3 GW of capacity under the 80-20 provision over the last two years. With nearly 13 GW of wind power capacity installed in 2012 alone, not to mention turbines of an older vintage not yet repowered, opportunity for repowering via the 80-20 provision stimulated interest in safe harbor investment — even at 60% PTCs. “As 80-20 strategies have become more sophisticated and owners and turbine OEMs have gained experience through the 2017-2018 repowering campaign, from execution and procurement to disposal and/or warehousing of vintage components, the lower level of PTCs remains lucrative for the manufacturer and especially for the owner that stands to gain 10 additional years of credits,” said Lewandowski. According to the report, 2022 wind-power market potential will hinge on lowering wind power’s cost of energy. Direct competition between wind and solar power will intensify in 2022 as solar projects coming online in the same year will be able to capitalize on the 30% investment tax credit (ITC) if project construction commenced or if the developer has incurred at least 5% of the cost of the facility before 31st December 2019. Developers will be eligible to qualify for a 26% ITC through 2020 and a 22% ITC through 2021, but all projects, regardless of ITC level, must come online by 31st December 2023. Additionally, by 2022, the tariff levied by the Trump Administration on solar equipment will have phased out, improving the technology’s overall cost position. The report highlights that wind-turbine equipment costs are also anticipated to fall. Although tariffs on steel and wind components from China may still be in place by 2022, mitigation strategies will have matured to allow some cost savings. Many of the new turbine models scheduled for installation in 2019 and 2020 will have reached serial production by 2022. “Wood Mackenzie expects turbines rated between 3 and 5 MW to comprise 67% of the market in 2022, a more than doubling of share from 2018, with turbines rated 4 to 5 MW accounting for nearly a third of installations. Not only is cost expected to decrease for this class of turbine models by 2022, but productivity will be significantly higher than legacy models,” he added. Could PTC rush jeopardize U.S. wind repowering opportunities?